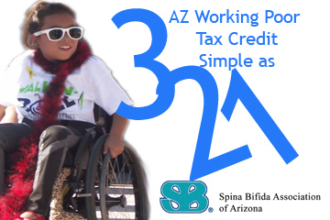 Even MONTHLY donations to SBAAZ qualify for the Arizona tax credit! Annual totals up to $800/joint or $400 single/HH will be directly applied to your individual tax liability…refunded to you… or carried over based on your annual giving…even EZ filers! “read more” for sample form and brochure with details. Or click DONATE NOW to set up your monthly donations automatically! Share your priorities with your community and help make the world a better place! Attend PHASE 2 Sessions starting Saturday 4/13/2019 in the EAST VALLEY. MUST PRE-REGISTER, call now 602.274.3323- Space is limited. 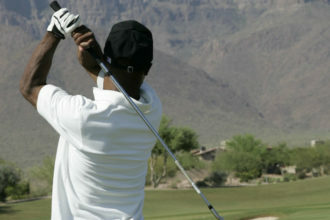 Register early for a great morning at the local Papago Golf Club. 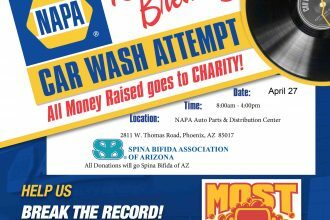 Following play enjoy a delicious luncheon with awards and silent auction… all to make life a little better for those with spina bifida in Arizona. Be a part of BEATING the Guinness world record…..VOLUNTEERS NEED. 2016 is our “Year of the Volunteer” – If you are dedicated to your commitments and have a desire to be a part of the mission to enhance the lives of those affected by spina bifida…or to share the prevention message and story of our amazing people, please read more info and connect with us! See site: www. strivemedical.com Walk N Roll supporter since 2016! Thank you Strive Medical for your 2017 GOLD Support!